Have I got cool friends or what? As many of you know, tomorrow is my birthday (yes, during finals week — sigh! ), but the gifts have already begun rolling in. 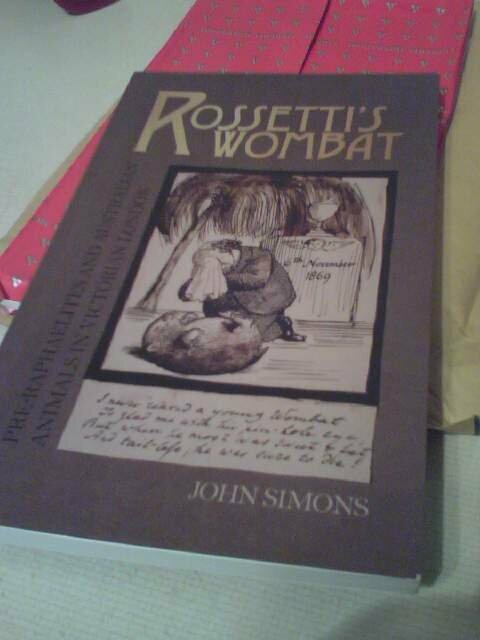 Pictured is the book from my friend Alessandra in Rome, who knows well my obsession with Wombats and found the perfect book to appease that. Simons’ tome addresses “Pre-Raphaelites and Australian Animals in in Victorian London” and is chock full of wonderful illustrations. I love it! Not to be outdone, the Boojums sent a lovely package — those of you who’ve received such packages know that the outside is every bit as lovely as the contents — with a fantastic map of London, a jar of Marmite and the most amazing card with a photograph of a magpie quill pen. Big smiles here, as you can imagine! Besides, when I got home a few minutes ago I had another package: pecan chocolates from New Mexico. Thanks, Mom and Dad! Happy natal anniversary, in two hours at least! Happy Birthday! May it be a great day and great year! Gracias to you both! I plan to ring it in with ice cream. Thank you! You're so kind. I have kind thoughts of Houston right now as it's supposed to be only 17 degrees here in NY today. Brr! LOL — Cranky, I want to hear it performed LIVE on Saturday!Joey, it is indeed a way cool book. If I bring it Saturday for you to look at, do you promise not to drool?